I’ll be honest, it hasn’t been a great month; but I’m faking it til I make it, I guess. I turn the big four-oh in May, and the thought is terrifying me. Not because I’m getting older – age is a privilege after all – but just because there are so many things I thought I would have achieved by this point in my life. I’m making a concerted effort to focus on the present instead of dwelling on the past or worrying about the future, and when I think about it, I have a lot of blessings to count: I have a lovely boyfriend/fiance (whose birthday it was yesterday, happy birthday my love); my family is well; I have a job and workmates that I enjoy to the point of being embarrassing about it; I’ve got my foot on the property ladder, and I love my new home; My friends are extraordinary, and every single day I think about how lucky I am to have such wonderful people in my tribe. Anyway. I actually put this dress up on Instagram a cool two months ago, and the photos I took have been been sitting in my draft folder since then. 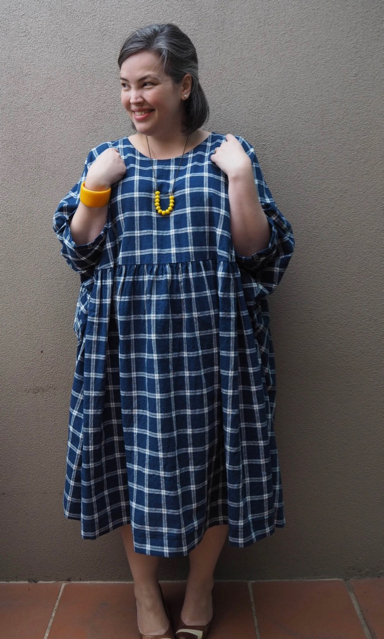 I love this dress so much that I just treated myself to a second one (in a black and white gingham) and it reminded me that I hadn’t posted a blog about it yet. 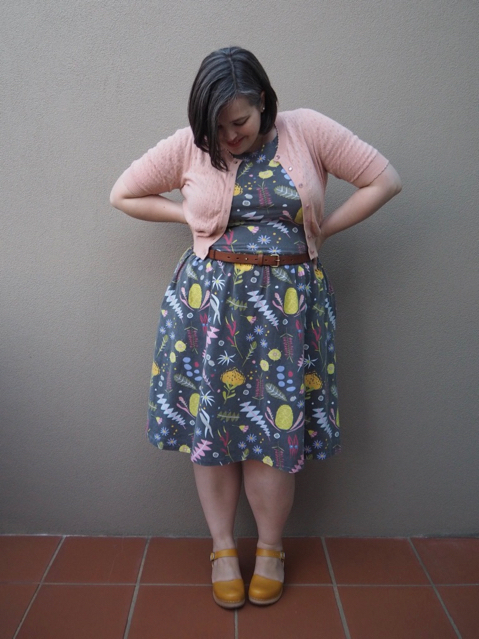 This is the harvest smock dress from Cottage Industry in Fitzroy. 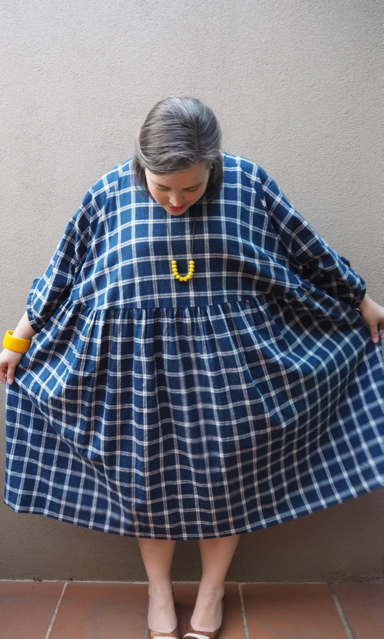 The legendary harvest smock dress from Cottage Industry? Yeah, let’s call it legendary. 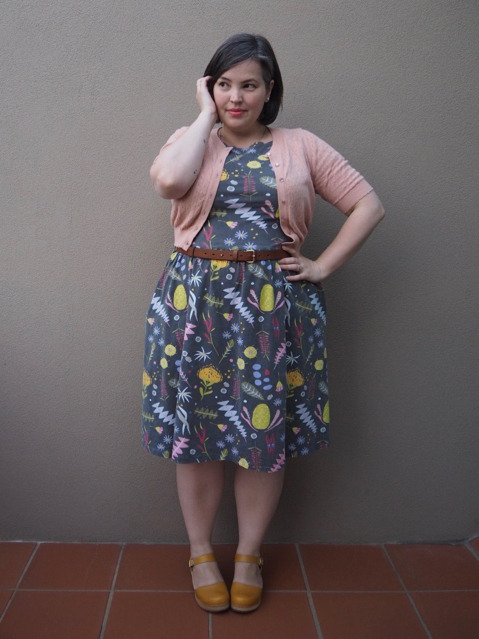 I’ve been seeing these dresses around Melbourne for years now. 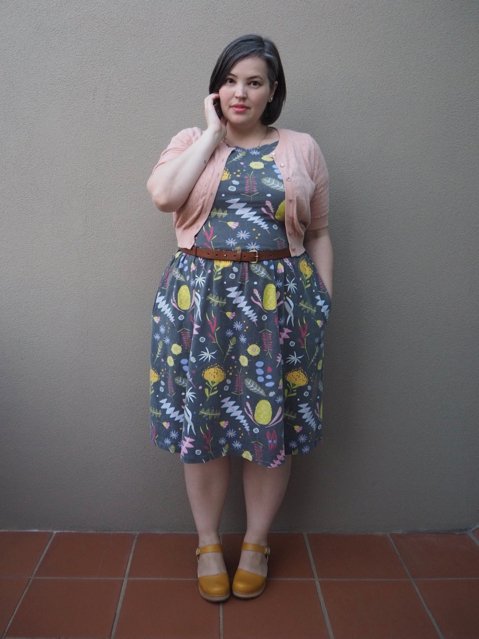 Sonya (formerly of Australian Fatshion) has one, and my friend Ella has the top version, and I’ve seen countless effortlessly cool women of all ages and sizes wearing them around town. After being told for the fifteenth time “Thanks, it’s from Cottage Industry” when I’ve complimented someone on their frock I finally decided maybe it was time to go check them out in person. “In person” is actually the only way you can check out these dresses. Dressmaker and shop-owner Pene Durston doesn’t have an online shop – she tried it once, but gave up after customers kept sending the dresses back saying they were too big. Because they’re a lot, you guys. There is a lot of beautiful, tactile, linen in these frocks. Three of me could probably comfortably fit in this dress. This much fabric, and no waistband… I should look like the size of a barn, but somehow I don’t. 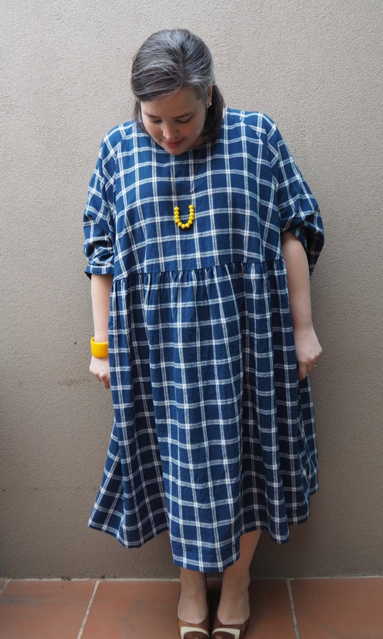 Pene’s managed to cut some clever seaming into the yards of fabric – the curved waistband, the batwing sleeves, the upturned sleeve cuffs – somehow it all comes together to make a drapey, voluminous dress that flatters every figure I’ve ever seen wearing it. It’s basically witchcraft. It is a lot though. I went back to the shop four times before I found one that I liked the look of on me. Fortunately the staff at Cottage Industry are a delight, and perfectly happy to let you try on every dress in the place before you make your decision. They’ll offer advice, tell you if something isn’t quite working, and they have The Book, where they take requests if what’s on the racks isn’t quite perfect. 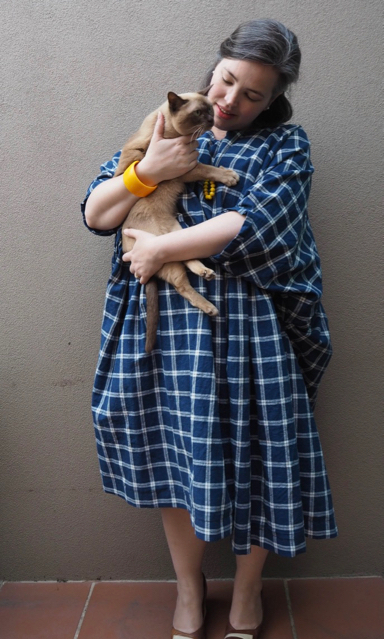 Pene is always experimenting with different prints and fabrics – the best place to keep an eye on the range is actually via her instagram – but if you see one you like, act quickly as she often sells out within the day. The Harvest Smock is available one-size-fits-all in a top, a short, and a long style. 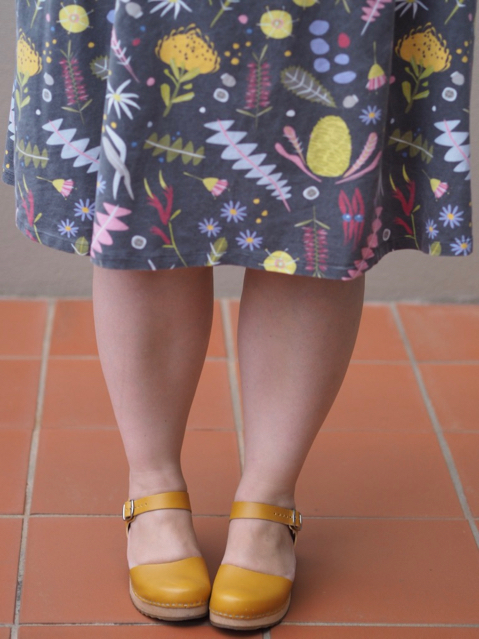 I bought the long (because the short showed my knees, and you all know how I feel about my knees) but lopped a couple of inches off the hem so that it hit me mid-calf. It’s easily the most comfortable dress I own, and it’s been getting a work-out over summer, especially those really hot days when I can’t stand the feel of anything on my skin but being actually naked isn’t an option.